A terrifying new study details the havoc being wrought by what scientists call "the most destructive pathogen ever" recorded on earth, finding that with help from unwitting humans a "silent killer" has caused major declines of frogs, salamanders, and hundreds of other amphibian species. The report, published in Science on Thursday, offers disturbing new information about a disease which scientists first detected in 1998-but whose power they didn't grasp until now. 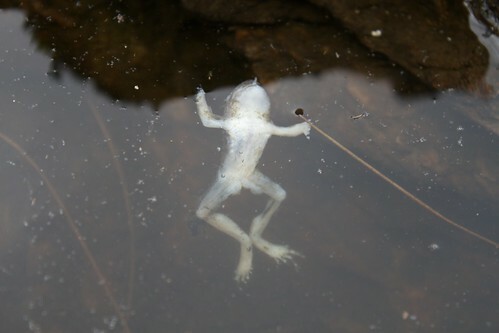 "We've known that chytrid's really bad, but we didn't know how bad it was, and it's much worse than the previous early estimates," Ben Scheele, an ecologist at Australian National University and lead author of the study, toldNational Geographic. "If it were a human pathogen, it'd be in a zombie film," biologist Dan Greenberg told National Geographic. Chytrid fungus does not infect humans-but human activity has helped to spread the disease. The pathogen is thought to have originated in Asia, and both legal and illegal pet trades have helped to spread it to Central, South, and North America; Europe; Australia; and Africa. The disease is widespread in the United States.